On 11th December 2017, BSWN held its Annual General Meeting (AGM) and a panel discussion titled 'Inclusive Growth – a mechanism for addressing inequality?’. The meeting and discussion were well-attended by over 40 individual and associate members of BSWN. The AGM was chaired by Dr. Marie-Annick Gournet who is also a member and the Interim Chair of our Board of Trustees. To see the full the full meeting minutes from our AGM, please see here. Too many people are left behind and it is now more than ever apparent in the region. We need to align our education and training more closely with business to cover workforce shortages and up-skill our workforce. Our equality charter led by the local authority is something we are actively looking at, and it will underpin the mayor’s work on the One City Plan. We want to see a growing economy and prosperity that is shared across the city. We are developing our One City plan that will look forward, providing an overarching view for Bristol, and will cover topics such as education, health, skills. We have so many successful but under the radar BME businesses that are sitting on the margins and we need to bring them into the mainstream. Panelists included: Ed Rowberry (BBRC), Poku Osei (Babbasa), James Durie (Business West), Abdi Mohamed (Bristol Somali Resource Centre) and Sado Jirde (BSWN). Chaired by Marti Burges. 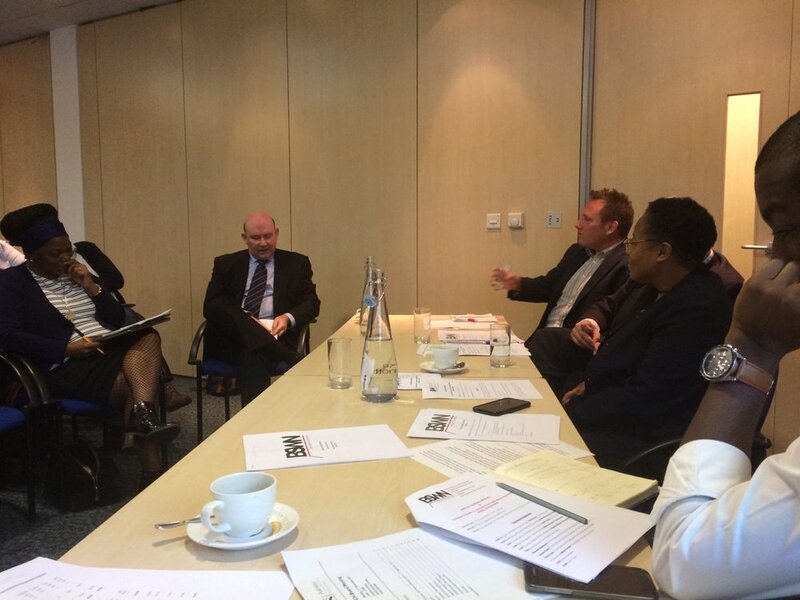 What are the drivers of economic challenges experiences by the BAME communities in the region? James: We’re at risk of not drawing on the talent that we have here. How do we draw up on them, and they are clearly in our BAME communities and all our communities. We need everyone interested in working in one way, shape or form. There are some strong trends, some of our BAME communities face barriers in the access. We need to start at a very early stage. It is an opportunity now with economy changing and Brexit coming. It’s a busy space but working with younger people from an early stage and help them to understand what the wold of business is. There is a need to try and find different ways to enable BAME communities to connect. It needs to be a two-way street and get that buy-in from the BAME community as well. Marti: To bring in Poku, who works with young people, how would you do it from your point of view? Poku: On the microlevel you can say we are looking at skills development, but in a traditional way. There is a great need for the soft skills. We need to look at the education system, because if they are engaged at an earlier stage, they will be better engaged in college. There is more responsibility from Corporates as well. If this is where their staff live and work, there is not just a moral imperative but also their duty to make the environment in their business more open. It’s about how do you contract. The government is moving in the right direction. Looking at capabilities that already exist in the communities and see it as an asset and how to then use that to our advantage. Sado: We have an economic system that doesn’t work. Bristol and the region is growing significantly and that is a good thing but its time to push and accept that there is inequality. We’ve had great conversations about inequality but we need to address that poverty and deprivation that furthers that inequality. People in the communities have a great potential for economic growth but there is no infrastructure to suppose them. Ed: Around the social investment market there is a tight conscription that prevents a start up or small organisations to gain any capital and access mentors and networks. On the ground interventions that are really well-tailored is what BSWN can provide and that is very valuable. There is an opportunity with Britain being so focused on GBA, for local authority to take up leadership in the region and look at the weaknesses and look at what is available locally instead. What are your thoughts on actual interventions on the ground? Tim: We are always that funder. We can start knocking down barriers by looking at that development of soft skills using local providers. We can help with how to access the information about finance, about how you find support for a small start up and we are developing the Growth Hub that works across the whole region but its something we nee to publicise more as a regional opportunity. We can be a part of the combined drivers of local interventions. I support the idea of the bottom-up approach and local hubs, but we won’t be able to be everything and therefore will require ideas such as these and on local delivery. Asher: Sometimes it’s about thinking outside the box. The one thing I always say is I am a disrupter, I will take a risk and sometimes we just have to see if it will work with a leap of faith. We won’t be able to give out so much grants as we do now. There is a recognition we will have to support small grassroots organisations, and we need to get them to a point where they will self-sustain. And we are developing a new model, where instead of grants, we can give three year short term loans to aid in that sustainability. Black organisations and business are in need of access to funding. Think about how BSWN can be the link with Growth Hub to be themselves sustainable and help others achieve that as well. It’s about thinking in a completely new way and thats how BSWN comes in. Q: Young people from BME community face challenges. Young people who are talented and educated and finish university, they struggle to get into the companies that are local, or in the jobs they studied in. Is it not key that young people get the opportunity to have internships or traineeshipS at these businesses so they can learn how to work there? Poku: It’s a valid point and it’s something we’ve been looking at delivering a programme that is focussed on opening up career level entry opportunities to young people. It won’t change everything but it’s a recognition of it being a problem and trying to tackle it. Abdi: What’s missing is quality career advice. Start early in school and explain and provide clear advice about careers, and opportunities for the young people. Tim: We know there are organisations and companies that do the work on the ground but they are not tied together to no longer be separate but work together to cover the region as an umbrella cover more ground and to combine the drive and knowledge that they have. Q: What about procurement? Small businesses may not be aware of all the opportunities that are available? Asher: We have to make sure that there is access to the opportunities and that we have a conversation around how to best provide this information to those who seem to be furthest from reaching it. James: There are a number of different routes to the opportunities. If you have a business, you need to make sure you are public sector ready, so you can then apply for these opportunities and be ready to take up that mantle. There is a big challenge around the career service, it’s a bit of a national crisis really. The provision is tiny and it’s often put on the shoulders of teachers who may not be in the best position to provide that advice. We need to train more people to mentor young people and develop ways to provide them advice. Audience comment: It is essential to have organisations like BSWN sitting where the decisions are made as wider community does not have access to influence these decisions. Unless communities are included in the planning, nothing will change. Q: How confident are you, especially Tim and Asher, that the strategy that you have explained will bring a noticeable outcome and reduce the gap between the rich and the poor, within the BME community. There is also the issue of discrimination and racism in the work market. We don’t talk about that and it is the important part. When will we see a change? Asher: We are starting at our own back yard. We really are trying to change the culture, and we internally as an organisation are trying to invest in training in staff and changing mindsets in the organisation. People laugh at the idea of graciousness, but we are service providers, and we need to provide a service that needs to be of quality. Tim, what have you done to set up your organisation to reflect your region? Tim: Having different partners in this room can start making real differences. Every one recognises the opportunities we have. Whether its in terms of race and gender, we have a huge untouched potential in this region. It’s important that we pool the business voices and ourselves, both as authorities and leaders, we can highlight that opportunity for the community. A local industrial strategy, we want to start writing what that looks like. Sector opportunities are there, what new industries are available to be invested into and built up, that we can incorporate into the strategy. There are a lot of long-term opportunities that we can explore.